SINGAPORE (Feb 13): Most emerging Asian currencies inched lower on Monday, as the US dollar held firm after a closely watched two-day US-Japan summit over the weekend did not unnerve markets by mentioning currency policy. US President Donald Trump and Japanese Prime Minister Shinzo Abe appeared to have had a smooth meeting, allaying investor worries Trump would talk tough on trade, currency and security issues with a key Asian political ally. That outcome led to a rise in the US dollar against the Japanese yen and helped support the greenback against a basket of six major currencies, with the dollar index edging up around 0.2%. 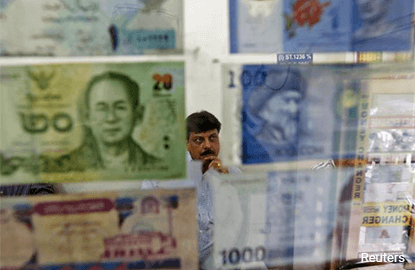 Most emerging Asian currencies inched lower against the greenback. Currencies such as the Singapore dollar and South Korean won slipped 0.1%, while the Philippine peso eased 0.2%. The moves in emerging Asian currencies were mild, however, as market participants await US Federal Reserve Chair Janet Yellen's testimony to Congress later this week, as well as details on President Trump's tax reform plans, expected in the next few weeks. "The market may remain in consolidation or range trade ahead of the testimony of Yellen," said Gao Qi, EM Asia FX strategist for Scotiabank in Singapore. "If Yellen sounds hawkish tomorrow evening then we could see the (US) dollar continue to rise and we will see, I think, a relatively big impact on...emerging Asian currencies," he said. Yellen is due to speak about the US economy and monetary policy before the Senate Banking Committee on Feb 14, and give further testimony before the House Financial Services Committee on Feb 15. The US dollar had gained against Asian currencies late last week after Trump promised a "phenomenal" tax plan in a White House meeting with airline executives on Thursday, renewing investor hopes for reflationary US fiscal policies. Still, given lingering uncertainty over the details of Trump's tax plan, and whether it would be supported by Congress, any gains in the US dollar could be limited in the near term, said Teppei Ino, an analyst for Bank of Tokyo-Mitsubishi UFJ in Singapore. "Although the dollar index is back at the 100-level, I don't get the sense that we will see an environment where we can expect it to rise above 102," Ino said, referring to the outlook for the US dollar against a basket of six major currencies.